Recently, I was looking around at tools and data made available by the City of Austin. 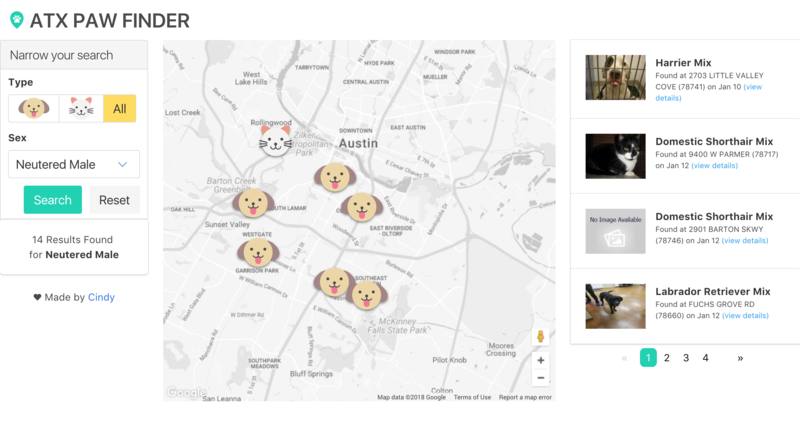 That's when I stumbled upon this page: Austin Animal Center Found Pets Map, screenshot below. When you first land on that page, you might find the design a bit underwhelming... especially if you're a designer. Despite it having filtering functionality, you may have missed it on first glance which is unfortunate because it allows for plenty options to narrow your search. How would I use it if I lost my dog today? I decided to see what I could do to make the filtering a bit less of an afterthought. For that, I can focus on the most likely user scenario: I just lost my dog, I don't really need to see a list of over 100 dogs and cats, right? I just want to see dogs. Next, my dog is an intact male. Cool, that brings the search results down from 146 to 35. That's much less overwhelming which is a welcome feeling if I'm likely already particularly emotional. I wanted the map to have all the markers on it but only show a few pets in the list at a time. I suppose I could make the markers stand out based on the 4 pets being listed at that time but that doesn't seem as helpful right now. I added some pagination to allow the user to cycle through the list, though. While I know my dog could have wandered off from where I thought I lost him, I'd want to narrow down the scope of the area too. Once I zoom into that area, I want to be able to click on a marker to isolate the dog found in that location. Each pet card in the list shows information about a pet and in an order that felt pretty natural. A picture, the possible breed and the date/location where it was found would be good to know right away. The rest of the details in the data are essentially just tag type of information. I thought some colorful, cute looking icons would serve as better map markers but thought they wouldn't stand out that well on the standard Google Maps theme. Using JSON, I changed the Map theme to look more like grayscale to fix that. With those things in mind, I rebuilt the tool in a way that I thought would be more helpful.